Robinson’s Farm Shop Restaurant in picturesque Halifax serves breakfast, Lunch and dinner serving home-grown, home-made British food at it’s best. Their speciality, however, is their meat; Robinson’s Aberdeen Angus beef from their own herd is matured on-site for 21 days, and with their locally-produced pork, lamb and poultry, you are literally dining from field to mouth. 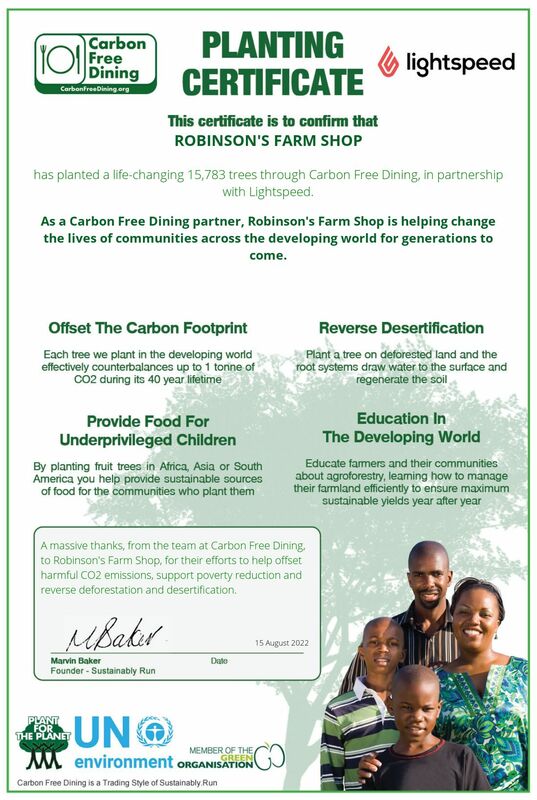 Robinson’s pride themselves on the sustainable nature of the food they serve and now, they have teamed up with Carbon Free Dining, the United Nations-backed Restaurant initiative. At their Halifax restaurant, they have chosen to demonstrate their love for the environment by partnering with the programme. As a Carbon Free Dining Certified restaurant, Robinson’s and their diners plant hundreds of trees each month, effectively offsetting the Carbon Footprint of the meals they serve. This is done by simply giving diners the opportunity of planting a single tree with each bill for an optional 99p.